Download tech sheet What is left on my spool? What the graph above means? We measure the diameter of the filament on the X and Y axis more than 4700× per second during the whole manufacturing process. 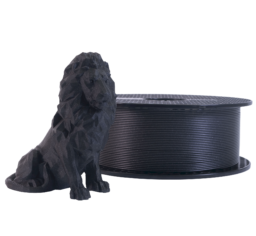 You can see averaged data of these measurements in the graph, so you can make sure that your filament spool is well made and is within the manufacturing tolerance of ±0.02 mm (±0.03 mm for blended materials). This is very important, because even the industry standard of ±50 µm may result in up to 11.4 % variation in volume, which means the diameter can be anywhere between 1.70 mm and 1.80 mm. In layman’s terms: it can lead to major problems regarding the printed object quality. That’s why our system will not allow any spool to be packed and shipped even if there’s only a single spot that is not within the tolerance. PLA is the most commonly used filament. It’s a very strong, easy to print and biodegradable material. The perfect choice for printing large objects thanks to its low thermal expansion (little to no warping) and for printing tiny parts because of its low melting temperature. PLA has a relatively low melting temperature of about 175 degrees Celsius. Unlike so-called thermoset materials, PLA can be heated past its melting point multiple times with very little degradation. It’s also a very hard material, which also means it tends to be slightly brittle, and once it breaks, it likes to shatter. The combination of being both biodegradable and having low-temperature resistance means that it’s not ideal for outdoor use, also because of a low UV-resistance. Even though PLA is biodegradable, and the material on its own is food safe, we do not suggest to repeatedly drink or eat from your 3D prints. Because of the small fractures on the print surface, bacteria can build up in there over time. You can prevent this by applying a food-safe coating. When post-processing PLA, it’s better to use wet sanding. Without water, you’ll quickly start heating the plastic by friction, which can result in melting/warping of the object. The best use of PLA is for printing concept models, prototypes, low-wear toys, etc. What is left on my spool? Do you need to know how many meters/feets are remaining on your spool? Just enter the weight (including spool) and find out.